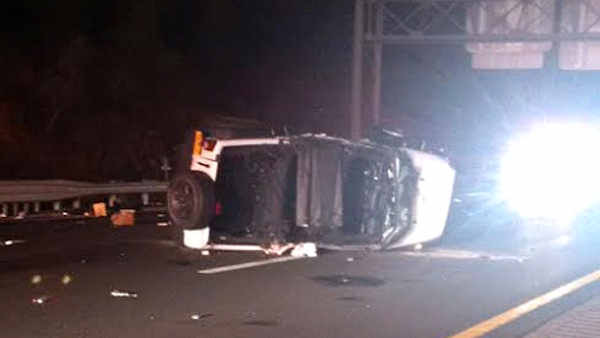 WOODBURY (WABC) -- An off-duty NYPD officer was injured in a crash Sunday night on the New York State Thruway in Woodbury. Alexis Penate was in his personal vehicle when it struck another vehicle and overturned northbound on I-87 between Sloatsburg and Harriman. He is in critical condition at Westchester Medical Center with head trauma and internal injuries. The preliminary investigation determined the 2015 Jeep Wrangler driven by Penate struck the rear of a 2003 Hyundai. The driver of the Hyundai, Aaron Jeronimus, 29 of Wallkill, NY and his passenger were uninjured.